The nanoPAD is part of Korg's nanoSERIES USB-powered slimline controllers, so small you can put them on your workstation, in front of your laptop, on a recording console, or anywhere else you need versatile control over your DAW, virtual instrument, effect, or DJ software. Despite its small size, this MIDI controller goes big when it comes to functionality. It's intuitive layout provides extremely easy operation for any user. 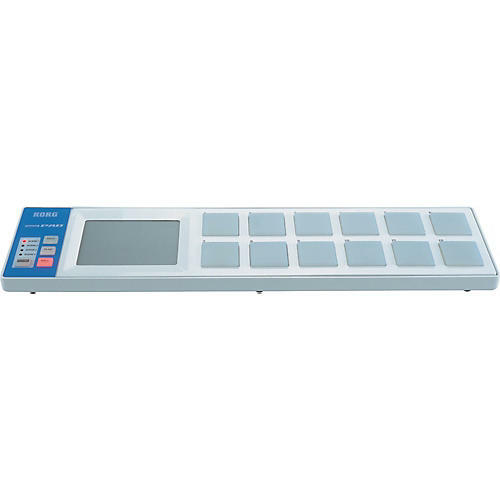 The Korg nanoPAD features 12 highly responsive trigger pads capable of sending both notes and MIDI control data, plus an X-Y pad with roll and flam functions to give you a unique interface for realistic drum programming. Even if the Korg nanoPAD MIDI controller is your first foray into MIDI control, you can rest assured that you'll be able to get connected to software quickly. The nanoPAD comes complete with a download code for Toontrack's EZDrummer Lite, offering super-realistic, highly responsive drums in a convenient plug-in, plus you can upgrade to the full version of EZDrummer for a special price. You also get a free downloadable Editor/Librarian to help you create setups to suit your specific control needs in all three models.